An early bearing dynamite strawberry that does well in hanging pots! The plants don't produce runners and so do well in compact gardens and containers. Produces sweet delicious 3cm fruits all summer long. Great germination rates. Sprinkle the seeds over the moist soil mixture and add a light dusting of soil over the top. The soil should completely cover the strawberry seeds, but not too thick. Keep the strawberry seeds moist and in direct sunlight. 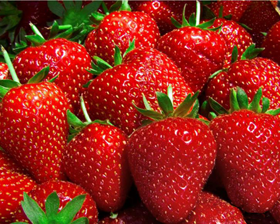 The strawberry seeds can take 10-30 days to germinate. Once the strawberry plants have sprouted, wait for them to reach 8cm or larger before transplanting into bigger containers.